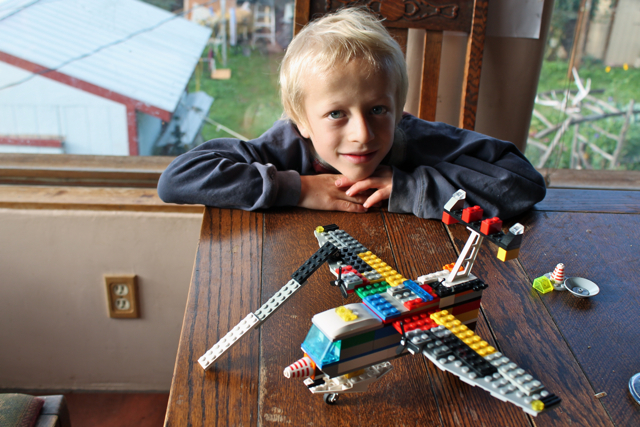 This is revision #53 on the lego airplane Col plans to enter in Kids Handicrafts, in the upcoming La Plata County Fair. This past week has been like a Boeing think-tank meeting in his brain: his airplane gaining and losing 3 new features daily, including a detachable back, emergency ramp on the wing, and the ability to land in a flood zone. Emergency ramp on the wing, version #51 (later scrapped). Dan, too, follows me around, muttering about root cellar revision #53. How he suddenly came up with extra 8 inches to accommodate in the door frame, except 2 days later the 8 inches have vanished. And dry stack this, and rock cutter rental that. And like the benevolent mother/wife I try to be, I dole out encouragement, support and doses of protein even though my mind—filled with precise word choices and the daily count of newly fertilized butternut squash—generally runs on a different frequency. When I found out Col was a boy (at his birth, in fact: Dan announced it with a glee that seemed impervious to the fact that he was also, er, 1 pound, 12 ounces) I wondered about this boyness. I wondered if I’d be able to relate. I worried that I wouldn’t. And goodness, there are 20 times a day when I’m watching Col in his element and thinking, “say what?” But, I love the way his neural circuitry works, and Dan’s too. As Dan’s packing for hunting, I’m thinking, What? No nightly hot dinner? And, he’s thinking, I’ll eat hot meals when I get home. This is the best adventure of my life. And really, it doesn’t so much matter if I can relate to these boys, that’s not the gold standard for parenting. No, it’s something more like encouragement, support and doses of protein. Come down to the County Fair and see me! I suppose that’s it. I listen to the inner workings of a mechanically minded man as he pulls apart a roadside found power tool (lawnmower, rototiller, saw….) and tells me that the previous owner made the simple mistake of leaving the fuel in it over the winter and it corroded the gasket and that it was merely a $7 dollar part…. but they didn’t know that so they put this gem at the curb. 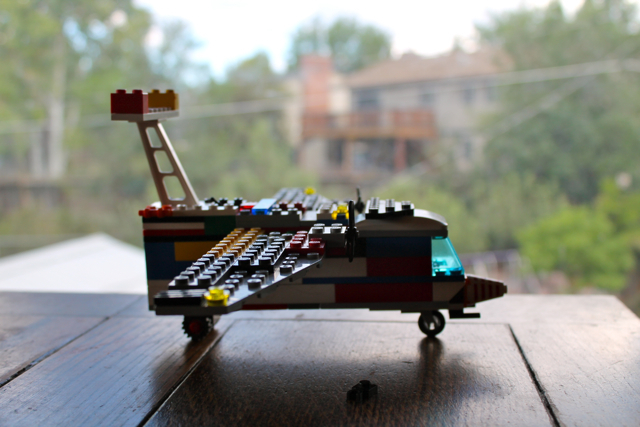 My lego boy & your lego boy would have a blast together. Cheers to sweet boys + good men and the women that love them. Happy weekending…. Hi Rachel! Yes, you are a stellar and fabulous wife and mother! What talented men in your life. And so mystifying. 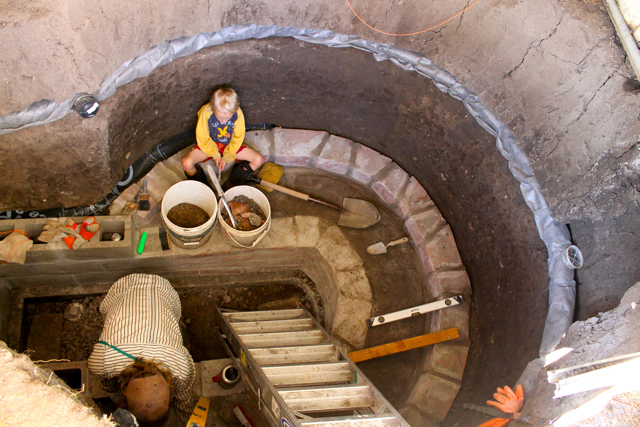 Is Dan buoilding a root cellar or is it also a Kiva? Funny you should ask. Col refers to it exclusively as “the kiva,” and Col spends more time in there than anyone but Dan, so maybe he knows something the rest of us don’t. Katie, Dan is a nut. But maybe someone from the Herald should write a story on the root cellar and incite men all over town. Encouragement, support, and protein. OK, I can do that! Though I should say that the Critter is so temperamentally similar to me that his boyness is not so mysterious. We’ll see about the Gnome. Yeah Col! Cedar is going to see your pane tomorrow at the fair! i think you’ve got the boy recipe nailed.